Huddersfield Town Chairman Dean Hoyle and his wife Janet Hoyle presented Huddersfield Mission with their share of the funds raised from the Town Foundation’s recent fundraising initiatives; amounting to £31,155. The money will help to sustain the exceptional support the local charity provides for people who are in need and require help in the local area. Instead of just handing money across, the Charity provides an advice and support service that looks to address the root cause of the problems. The donation from the Town Foundation will also help the Mission continue to run the affordable café it provides on Lord Street in the centre of Huddersfield, providing a nutritious main meal in a warm and friendly environment for just £2 a day. Funds were raised from the Town Foundation’s Big Sleep Out at the Stadium ahead of the Swansea City game and also from the sale of Meal Vouchers that can be exchanged for a free meal in the Charity’s café. “Our advisors can help with a range of subjects from housing and debt to mental health and addiction, but they can also provide a listening ear. 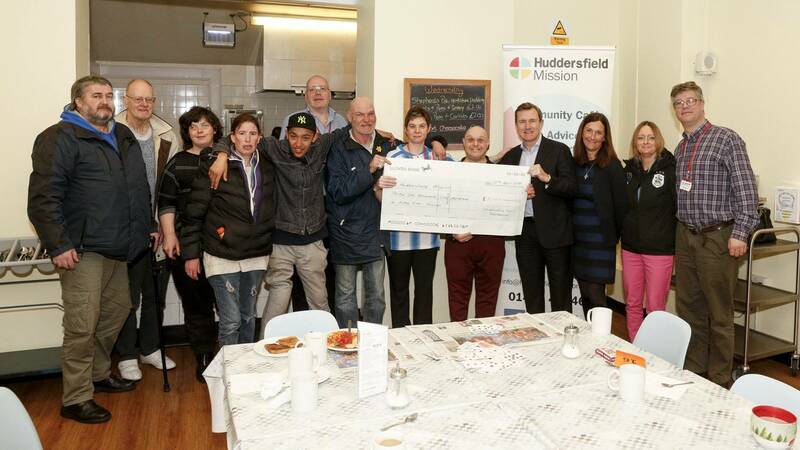 “On top of our work on the Big Sleepout, we’re delighted that Huddersfield Town and the Town Foundation can continue to support the vital work that the Huddersfield Mission undertakes in this way.